It is made of silica. The chemical formula is SiO2 (silicon dioxide). It has a hexagonal crystal system. 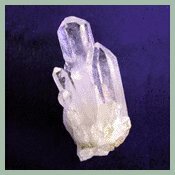 There are many varieties of quartz. These fall into two categories, macrocrystaline and microcrystalline. 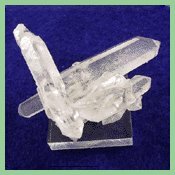 Macrocrystaline means that the individual crystals are visible to the naked eye. These forms are usually transparent. In microcrystaline varieties the crystals are only visible under high magnification. The microcrystalline varieties tend to be translucent or opaque. Amethyst, citrine, aventurine, rose quartz, smoky quartz, chalcedony, carnelian, onyx, and agate are all part of the quartz family. Quartz has many uses. It generates an electrical charge when mechanical pressure is applied. This is called the piezoelectric effect. This makes it useful in electronics and is most importantly used in the fields of radio, television, and radar. It is also used in making sandpaper and grind¬stone. Quartz sands are used in the manufacture of glass and mortar. Quartz is found in pegmatites and in hydrothermal veins. Precious metals like gold and silver are often found associated with quartz in these veins.